Sweets By Francesca: Happy New Year! I wrote a check today and dated it 1-4-10. It was wrong for multiple reasons. I feel like one of the old people saying, "I can't believe it's 2011, where did the time go?" and "Wasn't it just yesterday that we were stock piling water for y2k." Did you make any New Year's resolutions? My resolutions are always impossible to keep, lose 30 lbs and run a marathon (You can click here to read about last years). Yeah, right, have you ever read this blog before? I love to bake and I hate to run. This year I kept it simple. Organize my closet. Check and Check! I'm awesome. Your welcome, Goodwill. It's not a holiday without a festive cupcake. 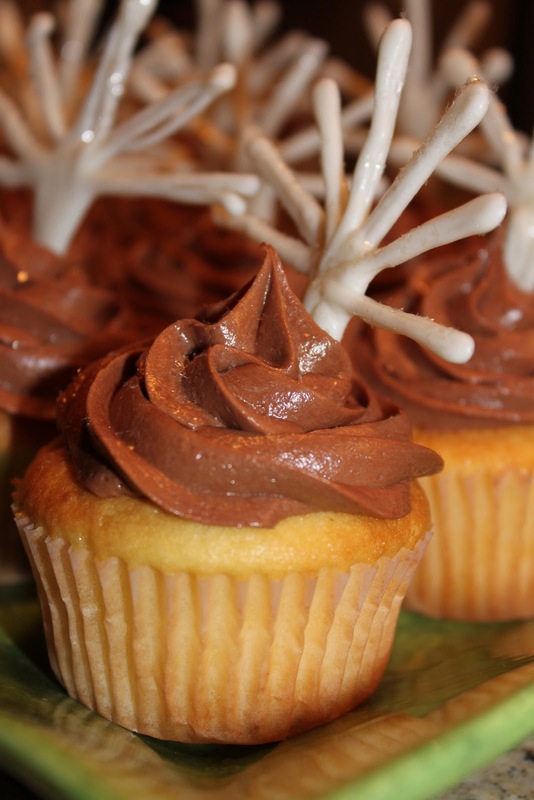 These cute guys are glittered New Year Cupcakes! The shiny-ness is glitter. Love. Those white chocolate starbursts are suppose to be festive...I think they are cute. My other New Year's Resolution is to make more cupcakes. mmm. That's a good one.